Tres Whitlock, 17, has been trying to enroll in a Hillsborough County charter school, but has yet to enroll because of concerns about the therapy and services he needs. Tres Whitlock is stuck in a public school where he feels ignored. He wants out. The 17-year-old would-be video game designer researched his options online and found his perfect match – Pivot Charter School. “It’s computer-based and I think I will do better,” he says. But when Whitlock tried to enroll in the school he found a series of barriers in his way. The reason? He has cerebral palsy, and the Whitlocks say school officials told them they don’t have anyone to take Whitlock to the bathroom. Whitlock and his parents are convinced their story isn’t unique – and enrollment data backs them. A StateImpact Florida/Miami Herald investigation shows most charter schools in Florida are failing to serve students with severe disabilities. Statewide, 86 percent of charter schools do not have any students classified as severely disabled. That’s despite state and federal laws that require charter schools to give equal access to these students. Tres Whitlock’s father, Maurice, says the family tried to alleviate Pivot’s concerns. The family even offered to pay for physical and occupational therapy. Maurice Whitlock still feels burned by the experience. Pivot principal Carmela David declined to talk about Tres Whitlock. She says her school has never turned away a student because they’re disabled. “That has never happened,” she said. Whitlock is still trying to get into Pivot. In the meantime, he’s been placed in a public school classroom that serves mainly students with mental disabilities. It’s a doubly-bad situation for Whitlock. He doesn’t feel mentally challenged. But he’s also being ignored because he isn’t able to raise his hand quickly enough to be noticed. Whitlock can’t control his vocal chords, so he communicates by typing his words into theDynaVox tablet that serves as his voice. When he’s asked about Pivot, his eyes widen and he smiles. With a twisted hand, he painstakingly types out his answer. The mechanical voice of the DynaVox can’t mask his emotion. Charter schools first developed as an alternative for parents unhappy with their neighborhood school. They are publicly-funded but privately-run. Charter schools are given the flexibility to try new ideas and hire the staff they want. According to state law, every student is supposed to have an equal shot at enrollment – including students with disabilities. But students with severe disabilities are not appearing in most charter school classrooms. StateImpact Florida and the Miami Herald gathered and analyzed data on K-12 students with disabilities from 14 school districts representing more than three-quarters of Florida’s total charter enrollment. • More than 86 percent of the charter schools do not serve a single child with a severe disability – compared to more than half of district schools which do. • In Duval County, just one student enrolled in a charter school has a severe disability. 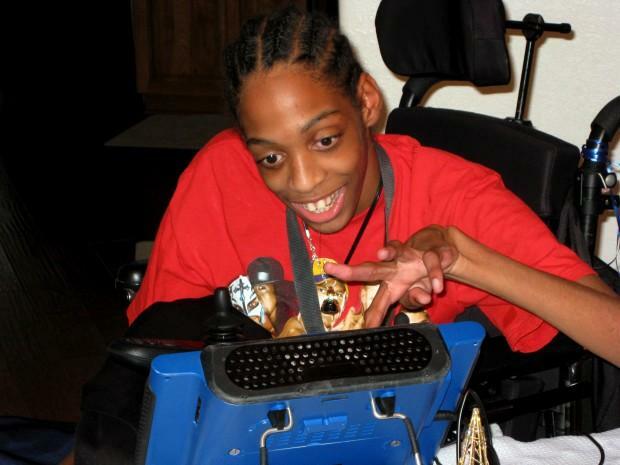 Duval district schools educate more than 1,000 severely-disabled students. • There’s not a single child with a severe disability in charter schools in Pinellas County, the nation’s 24th-largest school district. • The majority of charter school students with severe disabilities are concentrated in a handful of schools that specialize in those disabilities, often autism. The Florida Department of Education, citing privacy concerns, declined to provide detailed statewide data of students with severe disabilities. But the agency said their analysis shows 86 percent of charter schools statewide had no students with severe disabilities. It’s a trend repeated in California, Louisiana, New York and Texas, according to researchers from the Bill and Melinda Gates Foundation. HarvardUniversityresearcher Thomas Hehir calls it a “pattern of exclusion” among charter schools nationally. Hehir was the top special education official during the Clinton Administration and played a leading role in rewriting the Individuals with Disabilities Education Act. He says it comes down to money. In Miami-Dade schools, for instance, state funding covers only 58 percent of the total cost of educating students with disabilities. The schools have to make up the difference. This goes to the heart of the debate over charter schools. Opponents, especially teacher unions, argue that charter schools cherry pick students. That’s something the CEO of one of the nation’s largest for-profit charter school chains flatly denied in a May interview with the St. Petersburg Times. “By the law we must have an open enrollment process. Anyone can apply. And the process when we have more applicants than seats is a lottery without preferences,” he said. But for students with disabilities, there’s a loophole. Where special education students attend school is determined by their Individualized Education Program (IEP). That plan is developed by the student, parents and therapists. The IEP team won’t send that student to a charter school that isn’t set up to serve disabled students. School districts design a systemic plan to educate students with disabilities. Charter schools do not. Their solution is often to refer students back to the traditional public schools – as happened to Tres Whitlock. It’s a catch-22, according to Paul O’Neill. He’s an expert in special education at Columbia University. Even in the traditional public schools, not every school is expected to provide every service. About half don’t serve a single child with a severe disability. Instead, they’re sent to neighboring schools with specialized programs. “The reason that there are a larger percentage of charter schools without (severely disabled) students is that charter schools do not have the infrastructure and economies of scale to provide special programs to meet the needs of those children,” said Michael Kooi, director of school choice programs at the Florida Department of Education. Kooi says school districts are supposed to design an overall plan to educate students with disabilities and avoid duplicating services. “Charters as individual entities do not have this ability,” Kooi said. Families of students with disabilities have another option if they are unhappy with public schools: The McKay Scholarship. The McKay Scholarship provides tuition vouchers for students with disabilities to attend private schools. Students with disabilities who want out of their traditional public school may be opting for private school instead of charters. About 22,000 students were enrolled in the program last year. McKay scholarships comprised as much as 10 percent of all students with disabilities, in districts which provided the data to StateImpact Florida. Charter school officials said they recognize the problem and are working to correct it. Lynn Norman-Teck, spokeswoman for the Florida Consortium of Public Charter Schools, said students with disabilities will become more of a priority as the charter school movement matures. “I imagine that the children with disabilities will be next,” Norman-Teck said. “Unfortunately, just like they were an afterthought in the traditional public schools – not necessarily and afterthought, but it came with time. I think that will happen in time. Hage, the charter school CEO, points to one possible solution: entire charter schools that specialize in serving kids with disabilities. Orange County has a network of such charter schools. More than twice as many disabled students attend Orange County charters as any other county. In fact, when you factor out charter schools specializing in students with disabilities, charter schools enroll even fewer students with severe disabilities. These non-specialized charters enroll disabled students at a rate seven times lower than district schools. Those specialty charter schools are available only in the state’s largest counties. And even if a county does have a charter specializing in disabilities, it may be far away from the student. Harvard University’s Hehir has another name for this trend: segregation. He says it violates the students’ civil rights. “If we had similar patterns of exclusion of kids by gender or race, I think there would be much more outrage then there is on the part of government and on the part of people,” he said. Tres Whitlock’s mother, Tonya Whitlock, says Pivot may be allowed to deny her son entrance. But she says it certainly is not fair. They believe Pivot would be better for Tres Whitlock in a number of ways. Pivot offers half-day classes, which deals with Whitlock’s physical fatigue. One more example: Whitlock won’t have to raise his hand to get his teacher’s attention. At Pivot, he can just signal his interest through his computer. When they met with school officials in August, Pivot asked for testing and wanted to discuss Tres’ education plan, Tonya Whitlock said. The Whitlocks were willing to pay for some services themselves if it meant Tres could attend Pivot. They tried to schedule a meeting between school officials and Whitlock’s special education team, the group that develops and implements his federally-required Individual Education Plan. As the start of classes approached, the Whitlocks said Pivot school officials were slow to respond about to their meeting request. They decided to enroll Tres in a district school rather than miss school. Whitlock was given the option to attend a nearby school with a program for students with physical disabilities. But his younger brother went to their neighborhood school, Bloomingdale High. So he ended up in Bloomingdale’s program for students with autism. They’re still aiming to get into Pivot. Carmela David, Pivot’s principal, declined to discuss Whitlock’s specific case. She says Pivot must work with Hillsborough County special education experts to determine if the school is the best fit. The decision belongs to the district, she said. Pivot does not have any students classified in the state’s two most severe disability categories, according to Hillsborough County school records. Tonya Whitlock feels her son is getting left behind in the meantime. “They kind of get put in the corner and forgotten about in the public schools,” she said. The Whitlocks are not happy with their choices. Charter schools were designed for students seeking innovative methods and materials. They’re supposed to be an option for students and families who feel the traditional schools are not meeting their needs. But Tonya Whitlock says it may not be an option for them. MiamiHerald reporters Scott Hiaasen and Kathleen McGrory contributed to this report.